BREAKING NEWS: Chelsea agree €35m deal for N'Golo Kante - Expected to sign a 5-year contract. According to Le Parisien, Chelsea have agreed a €35m deal with Leicester City to sign N'Golo Kante and personal terms have also been agreed with the hardworking Midfielder due to sign a 5-year contract at Stamford Bridge. Personally, I believe this is excellent news as it's clear that after the sale of Ramires in the January transfer window, we were lacking in this area. Nemanja Matic struggles in that role without someone willing to do the hard work next to him and now we have the outstanding player of last season in Midfield next to him. For Chelsea to pull of such a deal based on the fact that we have no European competition at all this season whereas Leicester will take part in the Champions League is remarkable really as it's only natural to believe that you would want to remain for at least one season and have a crack at the tournament having worked so hard to get there. 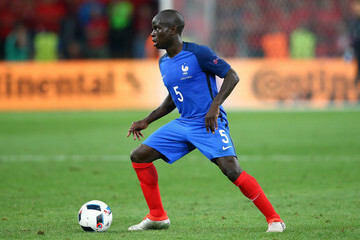 In saying that, you only have to look at Euro 2016 and Kante's overall involvement including being an un-used substitute in the Final and it's clear that the player feels that he needs to be at a bigger club (which is no disrespect to Leicester in any way) for his International career to move forward. So what of Kante who was signed by Leicester last summer for just £5.6m and where do we believe that he would fit into Antonio Conte's plans? Well as we know the 25-year-old works his arse off throughout the course of ninety minutes so he would be a definite starter in my book alongside Nemanja Matic and those two could form such a dominant partnership now. As I said previously here and many times on the Blog, Matic needs the security alongside him. He needs to know he is playing with someone who will work just as hard as he does to cover ALL of the ground in that area. When he gets that, he can really impose himself as he showed in glimpses last season with the Champions League fixture at home to Dynamo Kiev his best performance. Cesc Fabregas as much as we admire his ability with the ball at his feet, cannot tackle to save his life and simply doesn't have the legs in that area. If he is given a free role, deep with instruction to not worry about getting stuck in, but to pick up the ball from one of these two and to play his passes, that would suit him down to the ground. I know Chelsea to this point have been quiet in the transfer window but I have to say that I really like what is happening and has happened so far. It was clear we needed another Striker and we have done out and bought one. It's clear we needed to replace Ramires with another hard working Midfielder and it looks as though we have done that. What's your opinion of the signing of N'Golo Kante? What do you also think of a potential partnership with Nemanja Matic this season?